A pioneering research collaboration, which seeks to uncover the secrets of some of the UK’s most significant historical books, documents and artefacts, has received a significant boost. 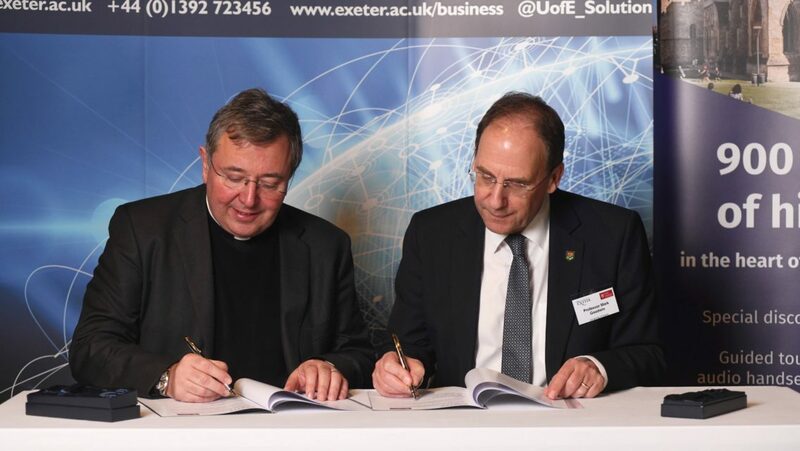 The University of Exeter and Exeter Cathedral have strengthened their research partnership by signing a Memorandum of Understanding (MoU), at a special ceremony on Wednesday, March 20th. The MoU not only marks the range of innovative work already carried out by the University and the Cathedral, such as the digitalization and analysis of the Exeter Book from the 10th Century, but also cements future collaborative research projects and funding bids. The new agreement was signed by Professor Mark Goodwin, Deputy Vice-Chancellor (External Engagement) at the University of Exeter and The Very Reverend Jonathan Greener, Dean of Exeter.. Professor Goodwin said: “Exeter Cathedral is one of the gems of UK’s history and culture and we are very proud to be able to work in partnership with experts there on joint research. “Collaborative agreements, such as this one, enable the University to work even more closely with valuable partners in the South West region and beyond. Through working with organizations such as Exeter Cathedral, we are able to share expertise and facilities and use the region’s excellent history to enhance understanding and develop employability skills. The University and the Cathedral have already enjoyed a successful research partnership in recent years. Most notably, experts from the University have been digitizing the Exeter Book – a unique tenth century book containing Anglo Saxon poetry, which is described by UNESCO as the foundation volume of English literature. The Book has been scanned through high-resolution digital technology, allowing researchers unheralded access to explore its text, as well as the delicate engraved drawings in the book’s margins. Other projects include investigating rare surviving pre-Reformation wax figurines which lay hidden in the cathedral for hundreds of years until exposed by a World War Two bomb, and new research into the life and work of John Grandisson, the Bishop of Exeter in the 14th century. As part of the collaboration, researchers have been working in the Cathedral Archive and Library. The University currently has a number of MoUs and Collaborative Agreements with key organisations across the South West, including Powderham Castle and the RAMM in Exeter, the Cornwall Museum Partnership, English Heritage and the South West Heritage Fund.